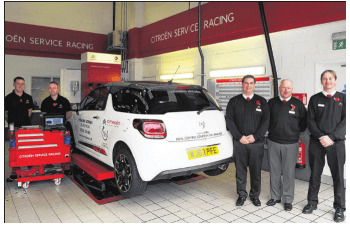 Howards Motor Group has taken a leaf out of the motor racing book and has introduced ‘pit stop’ Citroen Service Racing to their Citroen Taunton dealership. At Howards Motor Group, we are constantly striving to provide the best service to our customers, which is why we are one of few dealerships to trial and introduce the new ‘pit stop’ service. The speedy service means that customers can take a seat and watch the work being carried out on their car via a two-camera video link onto the television in the brand new waiting area. With the Citroen Racing Service scheme, we only employ Citroen-trained technicians to work on your vehicle, and use only Citroen-approved diagnostic equipment and parts, allowing you to rest in the knowledge that your Citroen car or van is in the safest hands. It’s also important to remember that you only pay for the work we agree on and quote for, so there are no hidden costs to our service. If additional work is required to be carried out on your vehicle, we will be sure to let you know and discuss your options with you. In addition to the servicing, we will also clean your car before we return it to you! As one of only four dealerships in the country to pilot this new racing-style servicing concept, it’s quite an exclusive service so we encourage people to get in touch and trial it at our Taunton dealership. For more information about the new Citroen Service Racing, contact Howards Motor Group at our Citroen Taunton dealership by calling 01823 729570.